cerebellum confectionary: Sometimes you have to wonder why. 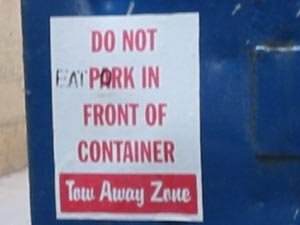 So, I saw this sign on a construction site dumpster a few months back, and took a picture of it, because it struck me as a wee bit odd. I mean, I do find it funny, but not for the reason that I would bet the person who added their personal touch to it intended. I just think it's hilarious someone would take the time to deface something, and have it be so tame. Posted by Crochet Gypsy at 12:57 p.m.